I just wanted to share another one of my favourite pics with you, taken in a LOVE coffee mug bought by my wife pour moi. As you can see, I’ve been practising my “latte art” and although I haven’t progressed to rosettas and big hearts, this is my second success with a little heart, so wish me luck every mornings when I practise my latte art and end up rushing to work and getting in just in time. 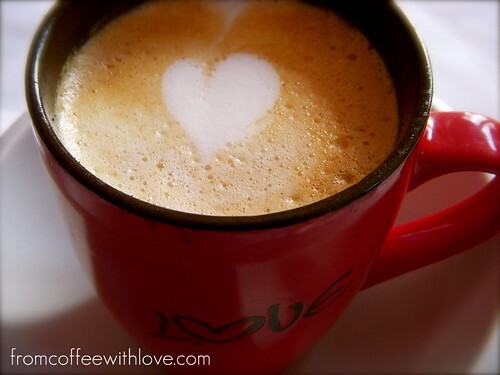 Wishing you a latte love morning, ciao. This entry was posted on Friday, April 25th, 2008 at 6:29 pm	and posted in The Art of Coffee. You can follow any responses to this entry through the RSS 2.0 feed.